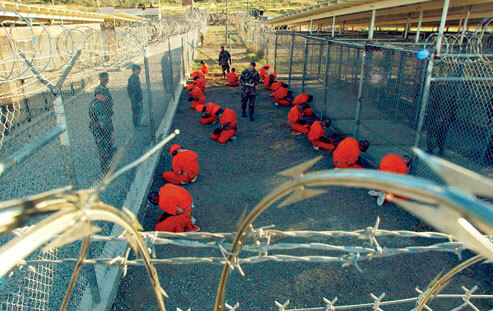 WASHINGTON, Jan 4 2013 (IPS) - Human rights groups are denouncing President Barack Obama’s failure to veto a defence bill that will make it far more difficult for him to fulfill his four-year-old pledge to close the Guantanamo detention facility this year. Obama had threatened to veto the 2013 National Defense Authorization Act (NDAA) precisely because it renewed, among other things, Congressional restrictions which he said were intended to “foreclose” his ability to shut down the notorious prison, which has been used for the past 11 years to detain suspected foreign terrorists. But, for the second year in a row, he failed to follow through on his threat and instead signed the underlying bill, which was passed by both houses of Congress last month and authorises the Pentagon to spend 633 billion dollars on its operations in 2013. “President Obama has utterly failed the first test of his second term, even before Inauguration Day,” said Anthony Romero, executive director of the American Civil Liberties Union (ACLU). “He has jeopardised his ability to close Guantanamo during his presidency. “Scores of men who have already been held for nearly 11 years without being charged with a crime – including more than 80 who have been cleared for transfer – may very well be imprisoned unfairly for another year,” Romero added. Obama’s signing of the law comes amid a growing debate – both within and outside the administration – about when and how to end the so-called “Global War on Terror” – especially its most controversial components – that Obama’s predecessor, George W. Bush, initiated shortly after the Al-Qaeda attacks on Manhattan’s Twin Towers and the Pentagon on Sep. 11, 2001. While he didn’t offer any specific answers, he indicated that a “tipping point” could be reached when Washington concluded that the group and its affiliates were rendered incapable of launching “strategic attacks” against the U.S.
On taking office four years ago, Obama ordered an end to certain tactics, notably what the Bush administration referred to as “enhanced interrogation techniques” that rights groups called “torture”, and “extraordinary rendition” to third countries known to use torture. He has since relied to a much greater extent on drone strikes against “high-value” suspected terrorists from Afghanistan and Pakistan to Yemen and Somalia. Some former Bush officials have raised the question whether Obama’s use of targeted killings – which Bush also used but not nearly as frequently – was morally or legally more justifiable than their use of “enhanced interrogation”. Some have even suggested that the administration has preferred killing suspects to capturing them, especially if their capture would require it to send more prisoners to Guantanamo, something Obama pledged not to do. Particularly controversial was the targeted killing of a U.S. citizen and alleged Al-Qaeda leader, Anwar al-Awlaki, in Yemen in 2011. A federal judge in New York ruled Wednesday that she could not require the Justice Department to disclose an internal memorandum that provided the legal justification for that attack, but noted that such actions appeared on their face” to be “incompatible with our Constitution and laws”. On the very first day of his presidency four years ago, Obama issued an executive order directing the closing of Guantanamo Bay, which he called a “sad chapter in American history”, within one year. At the time, he ordered a review of the cases of the approximately 250 detainees who were still there – down from a high of around 800 shortly after it opened in January 2002 – to determine whether they could be prosecuted in civilian courts on U.S. soil or released. But the administration’s plan encountered heavy resistance in Congress, particularly from lawmakers who strongly opposed the transfer of any suspected terrorists to detention facilities or prisons in their jurisdictions or their trial before civilian courts. By 2011, Congress attached amendments to critical defence bills restricting Obama’s ability to repatriate detainees and banning their transfer to the U.S. mainland for any purpose, despite the fact that the yearly cost of holding a prisoner in a maximum-security U.S.-based facility would be a fraction of the estimated 800,000 dollars it costs to hold a detainee at Guantanamo. The NDAA also imposes curbs on the administration’s ability to transfer or repatriate some 50 non-Afghan citizens who are currently being held by U.S. forces in Parwan prison at Bagram Air Base in Afghanistan.